I have been waiting to see how long the British Prime Minister, the British Foreign Secretary, and the British Defense Secretary could continue to lie through their teeth before it caught up with them. The liars got away with their lies longer than would have been possible if there was any longer any respect for truth in Western governments and media. The British Foreign Secretary announced publicly that he was personally told by someone at the Porton Down laboratory that it was “absolutely categorical” that the nerve gas allegedly used in an attack on Skripal and his daughter came from Russia. The chief executive of the Porton Down laboratory has now stated that the scientists at the laboratory cannot confirm that the nerve agent is Russian. This is the Russian government’s own stated conclusion. Actually, the UK, a militarily insignificant country, would not have dared to make this level of provocation to Russia, which is capable of wiping the British off of the face of the earth in a few minutes at zero cost to Russia. The British were acting as agents of their masters in Washington. Surely, the Russian government knows this. In “the Western alliance,” the only country permitted to have an independent policy is the US. The question before us is: what is the point of this blatent transparent provocation of Russia? What is the American deep state trying to achieve. 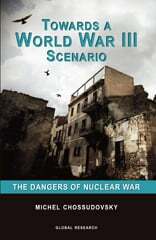 Surely not to get the world destroyed in nuclear war, or so one would hope. Nevertheless, war is a possibility. Pat Buchanan, a man of intense Washington experience, has asked, rather than asserted, if Trump is assembling a war cabinet with his choice of chief warmonger John Bolton as National Security Adviser, his choice of warmonger Mike Pompeo as Secretary of State, his choice of the woman who ran the secret CIA torture prisons as CIA Director. If this is not a war cabinet, what is? It makes Hitler’s war cabinet look mild. The demonization of Russia that has been ongoing since the Russian government blocked Obama’s planned invasion of Syria in behalf of Israel and Obama’s bombing of Iran in behalf of Israel has the appearance of preparing Western peoples for war with Russia. Before Washington destroyed Iraq, Libya, Afghanistan, Yemen through its Saudi proxy, and attempted to destroy Syria through its “democratic rebels” proxy, Washington demonized the leaders and the countries that were subsequently destroyed. Why should Russia not think that Russia is being set up for destruction in the same way? This scenario, should it be the one unfolding, is too scary. Unlike Hitler, whose secret weapons were not ready in time, Russia’s are. The West is so outclassed that nothing whatsoever will remain of the West if Russia’s weapons are unleashed on an arrogant, stupid, West drowning in Washington’s hubris. Another possible answer to the question is that Washington is playing to the Atlanticist Integrationists in the Russian government and business and financial elite. The message is that you will never be accepted into the West until you get rid of Putin and accept Washington’s overlordship. Some of the Russian elite find this to be a tempting proposition. In my opinion it includes members of the Russian Academy of Sciences who value their relationships—free trips and paid speeches—in Western capitals. Washington buys everyone, Russian academics not excluded. Washington is making clear that paid trips for Russian academics abroad are at stake, Western financial holdings of Russian businesses and oligarchs are at risk of seizure along with Russian real property abroad, and important members of the Russian government and elite risk being sanctioned from traveling to the West. In other words, Washington is telling members of the Russian elite, get rid of Putin, or we will get rid of you. 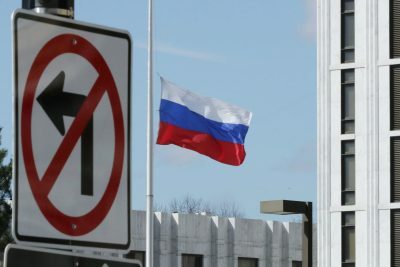 Just as Russian athletes were framed on false doping charges and prohibited from participating in the Olympics, now it seems Washington intends to cancel or boycott the World Cup in Russia. Washington intends to use Russian athletes against Putin, who is blamed for the expulsion of Russian athletes from the Olympics and for Russia’s possible loss of the World Cup. What should Putin make of Trump’s invitation to come to Washington to discuss the arms race? My advice to Putin is not to accept. It is too risky for Putin to put himself in Washington’s hands where he could be arrested on any number of false charges for which he is already set up in the Western media. He stole an American election — a felony. He invaded Ukraine and stole Crimea — war crimes. He poisoned Skripal and his daughter — attempted murder. He invaded Syria and defeated the “democratic forces” striving to bring democracy to Syria — more war crimes. He covered up Iran’s nuclear weapons program. Considering the compete and total lawlessness of the government in Washington, why would any sane person as demonized as Putin go there? Washington doesn’t even respect US law. Torture is a US crime as well as a crime under international law; yet President Trump has appointed a US and international criminal to be the Director of the CIA!! Putin should tell Trump that whenever, if ever, Trump achieves control of the Deep State and can act independently as a president of the United States, then, and only then, he is welcome to Moscow to discuss the conditions on which the two countries can cooperate and mutually benefit. God forbid that Putin, who holds all the weapons cards, agree to any arms control with a government that has broken every agreement and thrown the pieces into the face of the Russian government. If Putin succumbs to the Western harlot, Russia will be destroyed. Washington is a hostile and determined enemy of Russia. The inability of Russia to accept this conclusion is a direct threat to the existence of Russia.